H. Harrison, Larry Rivers, New York, 1984, pp. 62 and 133 (illustrated in color). S. Hunter, Larry Rivers, Barcelona, 1989, p. 52. 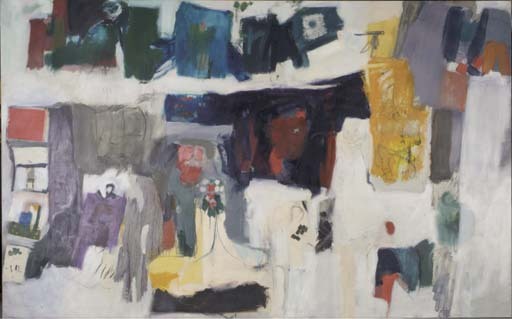 Rivers began his autobiographical "Me" series in 1959, when he painted the first work in the series, Me, now in the collection of the Chrysler Museum of Art in Norfolk, Virginia. During an interview with a curator from the Chrysler Museum, Rivers noted that Me II followed Me, although it had often been incorrectly dated as 1958. Both works were painted during an important period in the artist's life. His mother-in-law, Berdie, his muse and the omnipresent matriarch of his family, passed away in 1957, resulting in Rivers' move back to New York City from Southampton. In 1958, Rivers portrayed the Beat Generation icon Neal Cassady in the legendary film Pull My Daisy. During these years following the move back to the city, Rivers' technique changed, and his works grew in size and became more inclusive of the broad gestural strokes that defined the Abstract Expressionists. Rivers' grand canvases from this time are bathed in large areas of color evocative of Franz Kline's work in particular. The artist continued, however, to include fragments of images that seem to convey personal or cultural associations, which contribute to the abstract nature of his work. During the creation of Me, in 1959, Rivers gave an interview to Frank O'Hara, for Horizon magazine. During the interview, Rivers discussed the work, saying: "It will be an extra-extra-large canvas, with glimpses of everything that's happened to me from birth to the present. I expect it to go down in history as the most egomanical painting ever" (quoted in F. O'Hara, "An Interview with Larry Rivers," Horizon, September 1959, p. 102). Rivers drew inspiration for both Me paintings from family photographs among other source material, which helped convey the feeling of time elapsing. "Throughout his career [Rivers] has been drawn alternatively, and impartially, to the most casual aspects of ordinary existence and to the sacrosanct icons of the modern and old masters, to whose work, more often than not, he has given an irreverent and vernacular twist. He was also drawn to the human face and form and produced numerous individual and group portrait studies both of casual acquaintances, on commission, and of his own large circle of artistic and literary friends. Mainly, however, Rivers' art of nearly four decades offers the viewer the visual flow of everyday life. Most often the viewer is transported to the realm of Rivers' personal history, and to the pages of a family photo album, in such instances as the 1958 [sic] Me II, and the 1979 Wedding Photo (Social Patterns). The imagery here makes contact with Pop Art, but remains profoundly personal, if offhanded, in its associations and presentations. Alternately, there are the more direct painterly, often repeated depictions of cigarette packs, cigar boxes and other preferred commercial icons" (S. Hunter, Larry Rivers, Barcelona, 1989, p. 52). Me II is much more visually dense than Me, chock full of disparate images of life: a wedding couple and other anonymous figures, the cryptic collaged numbers "22 45", vast swaths of strong color and delicate underdrawing. The composition is as complex as the artist's own life, and perhaps even more poignant and evocative in the year following his death for its ability to represent a man who was eulogized in The New York Times as "the irreverent proto-Pop painter and sculptor, jazz saxophonist, writer, poet, teacher and sometime actor and filmmaker, whose partly self-mocking bad-boy persona encapsulated the spirit of a restless era that shook up American art."